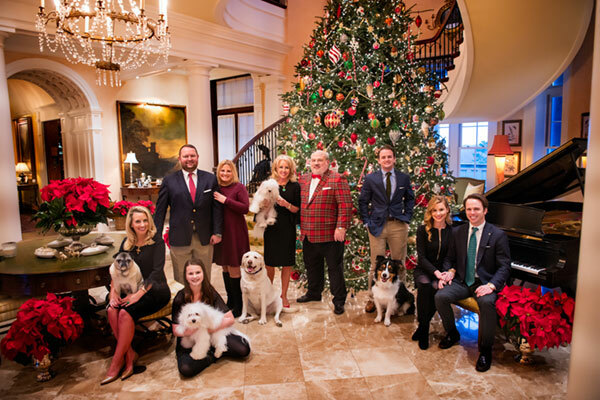 The Jones family gathers for Christmas 2018. From left: Abby Jones, Chris Pendergrass, Courtney Jones Pendergrass, Janie Jones, Allan Jones, Bailey Jones, Katie Jones, Will Jones. Front row: Gincy Pendergrass. Three generations of the Jones family are pictured here at Creekridge, the millennium house Allan had built to last over 1,000 years. From the left: Abby Jones, Chris Pendergrass, Courtney Jones Pendergrass, Janie Jones, Allan Jones. Front row: Bailey Jones, Gincy Pendergrass, Will Jones, Kathryn Simpkins Jones. 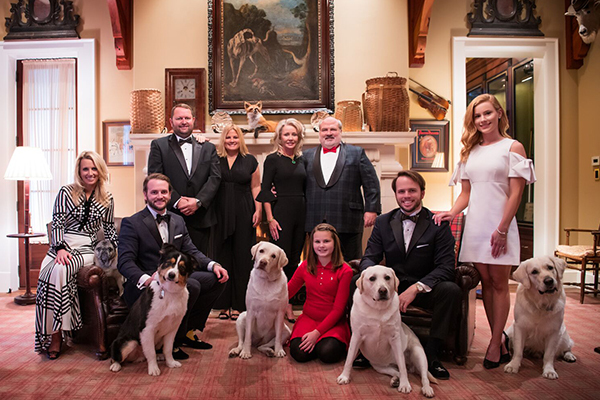 Allan is pictured here, in his Hardwick blazer and bowtie with his family for their annual Christmas photo. 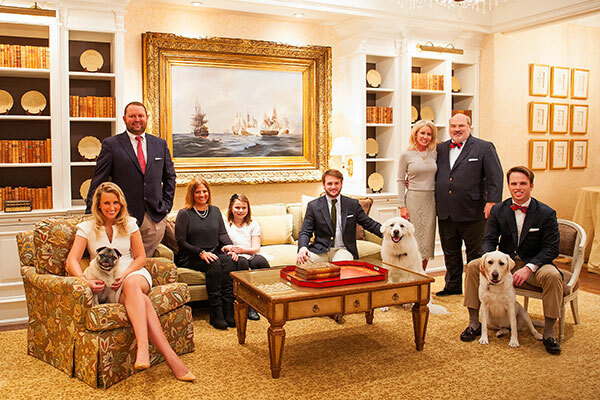 From left: Abby Jones, Chris Pendergrass, Courtney Jones Pendergrass, Gincy Pendergrass, Bailey Jones, Janie Jones, Allan Jones and Will Jones. 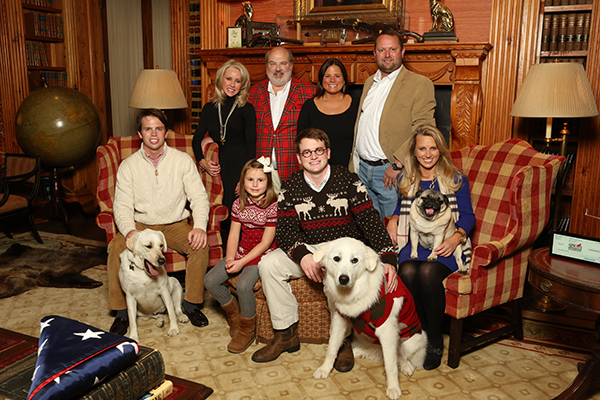 Allan (red jacket) is pictured here with family during a recent Christmas holiday. 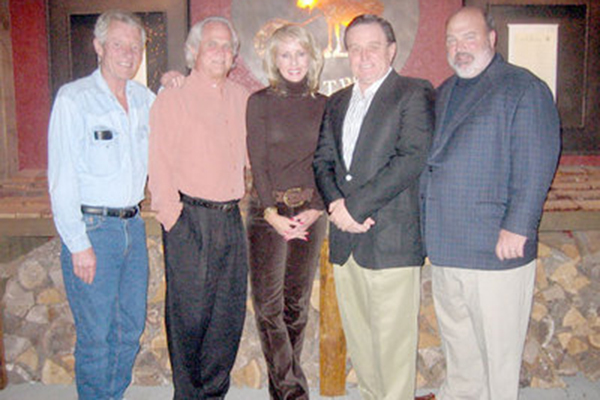 From left: Will Jones, Janie Jones, Allan, Courtney Jones Pendergrass, Chris Pendergrass. Front row: Gincy Pendergrass, Bailey Jones, Abby Jones. 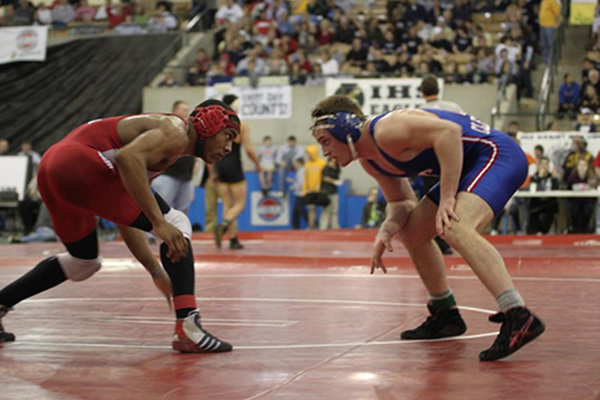 This picture is from the 160lbs Tennessee State semifinals in 2010 - Bailey Jones, Allan's youngest son, is shown en route to the winning the state championship (blue uniform). Allan is a car enthusiast. 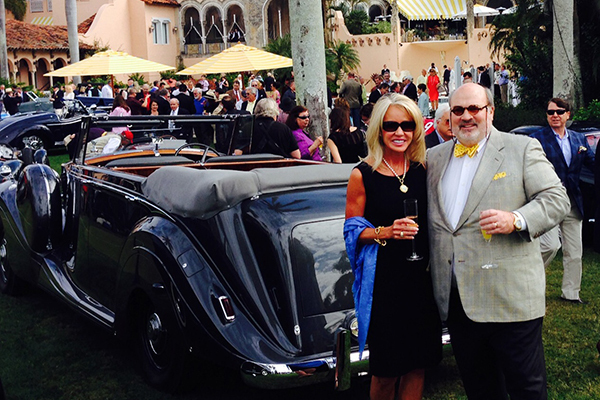 He and his wife, Janie, are seen here at Mar-a-Largo in January 2014 for the Cavallino Classic. The Cashdales from Check Into Cash are a team of horses that travel the country on behalf of CIC. The Cashdales contain two of the eight members of the 2010 World Championship Team. 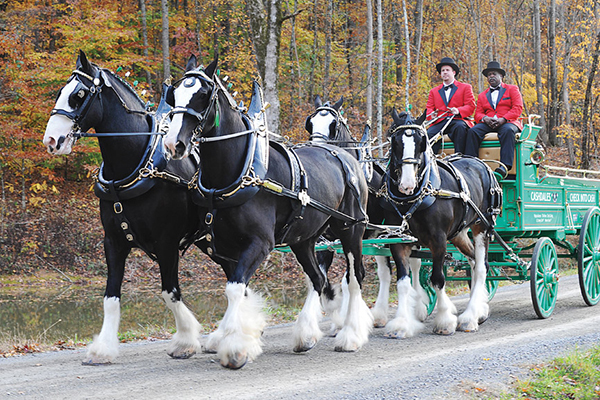 The horses are black with white stocking markings, which makes them rare among the Clydesale breed since less than 9 percent of the breed carry the mixed colors. The horses are an equally matched team at 18.2 hands tall, which is significant because in order to compete the pair must be the same height. Visit http://cashdales.com for more information. Based in Cleveland, TN, Jones Airways includes a Bombardier Challenger 600, a Beechcraft Baron, an Aviat Husky and its latest acquisition, a Dassault Falcon 900B. The business jets are chartered through Priester Aviation by customers that include politicians and well-known entertainers. Jones Airways has demanding standards for its aircraft. 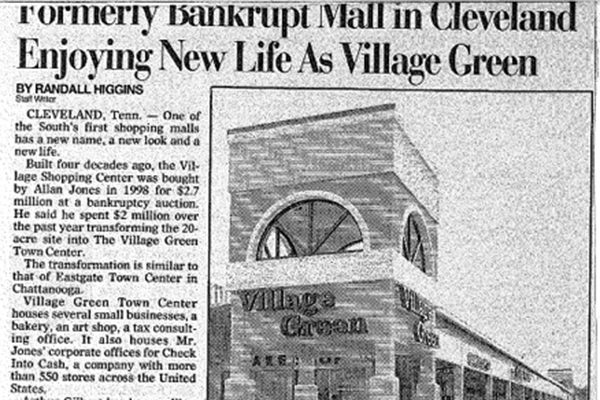 Allan worked for years to bring a much-needed new airport to Cleveland, TN. When the airport finally opened in 2012 – named KRZR - Allan’s plane was the first to land. 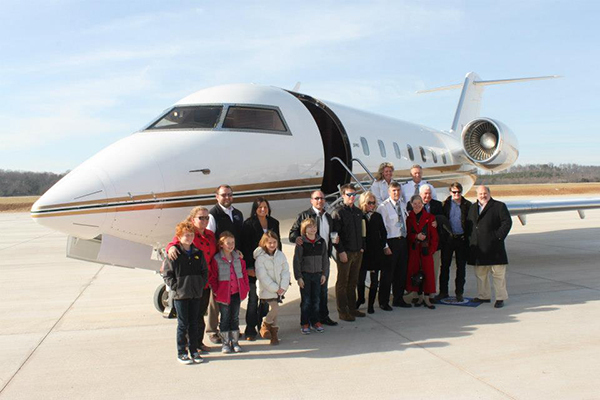 Jones (far right, navy coat) is pictured here with friends and family after the historic flight. Allan grew up watching the Captain Kangaroo television program and eventually acquired several key pieces of memorabilia from the show – including the Dancing Bear costume, the keys to the Treasure House, the Captain’s jacket and wig, and the Wizard’s costume. 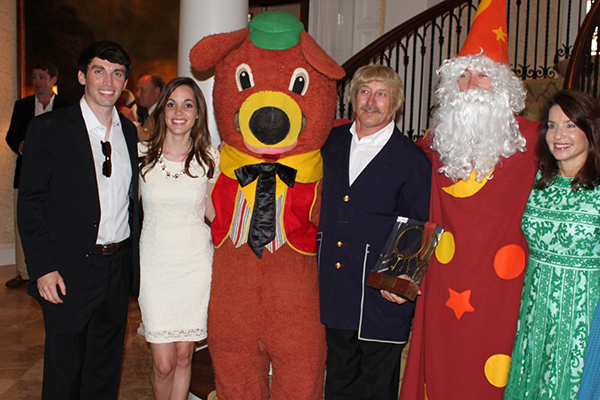 Guests are seen here posing with the items at a recent event at the home of Mr. and Mrs. Jones. Allan is the creator of Tall Betsy - the Official Halloween gobline of Tennessee. 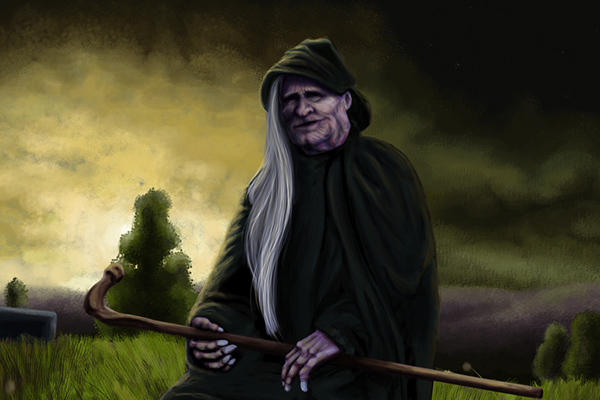 In 2011 Tall Betsy was the subject of a documentary by Zac Adams. It was narrated by Lynn Hoffman, host of A&E’s popular "Private Sessions." Visit http://tallbetsy.com for more information. 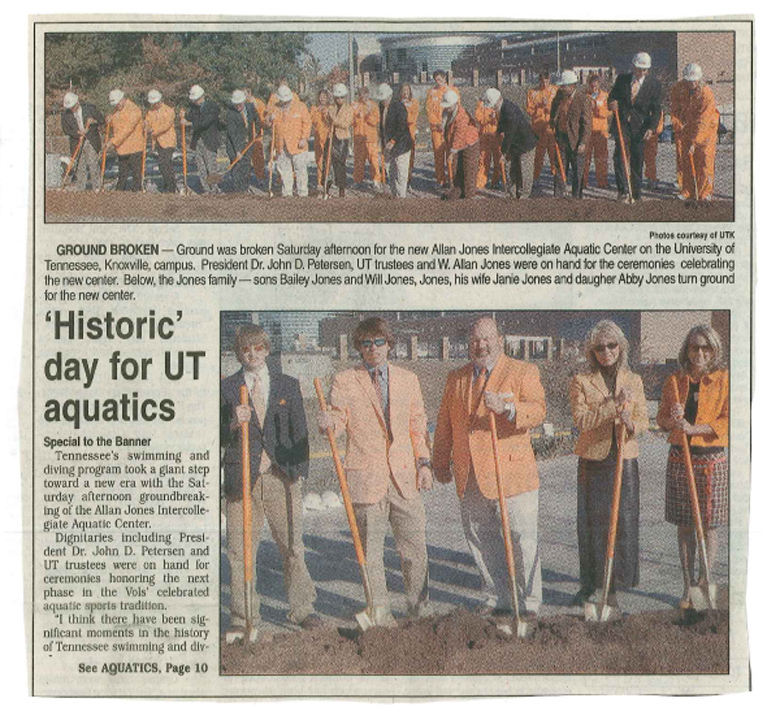 Allan Jones was the sole founder for the Allan Jones Aquatic Center at the University of Tennessee at Knoxville. The Jones family is seen here at halftime of a Vols game. 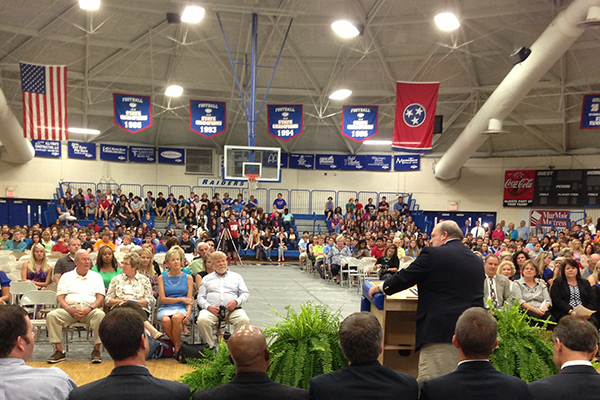 The appearance was to announce a major donation to the school. 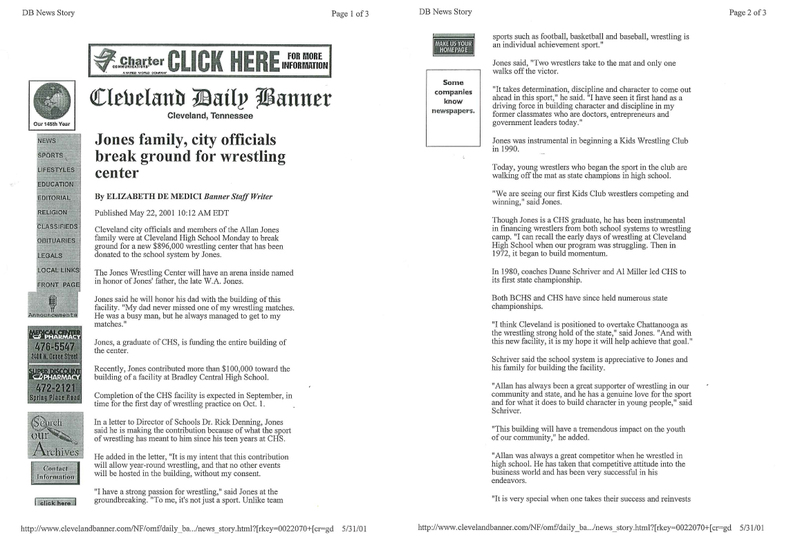 Allan Jones received media attention for his efforts to revive a struggling Cleveland landmark. 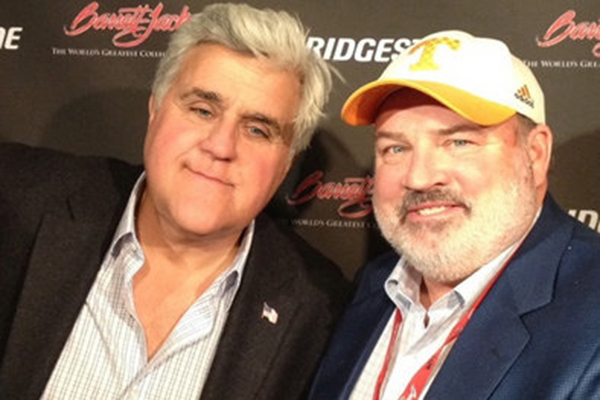 Allan Jones is seen here with Jay Leno at a recent Barrett Jackson classic car auction. The Chattanooga Times Free Press profiles Allan Jones. Allan and Janie Jones pose with the cast of Leave it to Beaver in this photo taken at the Bald Headed Bistro restaurant. 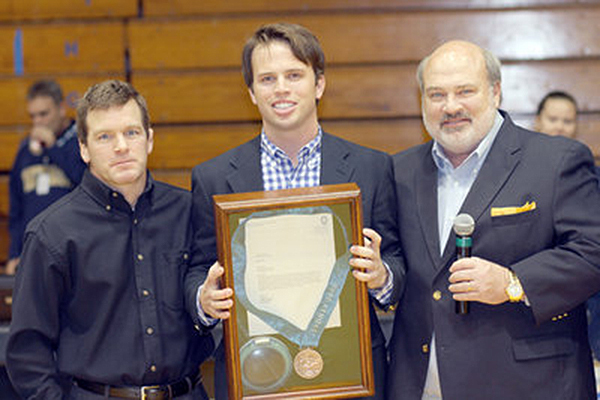 Allan Jones is seen here during his induction into the Cleveland High School Hall of Fame. 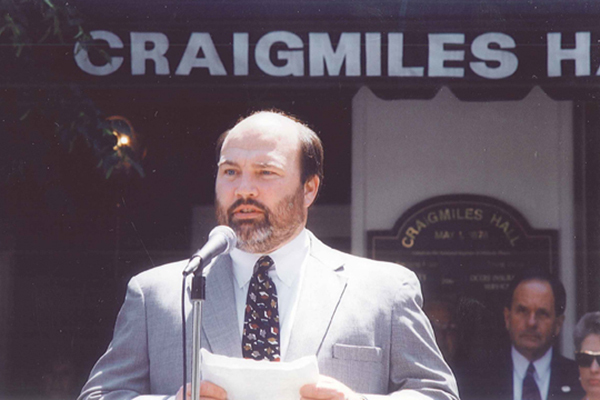 Allan Jones is seen here at the 1996 Craigmiles Hall rededication ceremony. 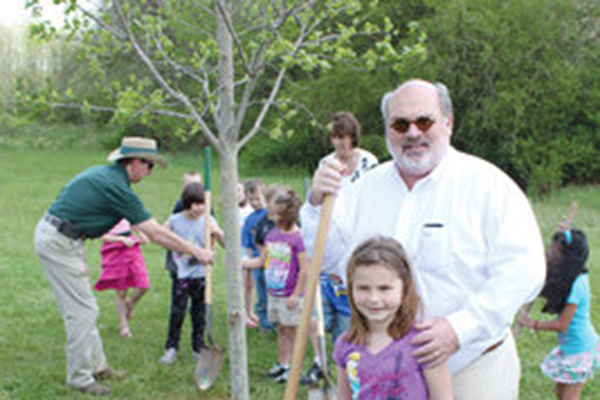 Allan Jones is seen here with his granddaughter Gincy during a tree planting at a local elementary school. 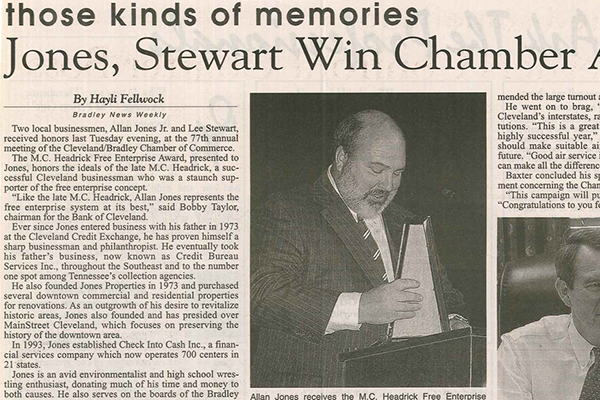 Allan Jones was the winner of the MC Headrick Free Enterprise Award, the highest honor given by the Chamber of Commerce. 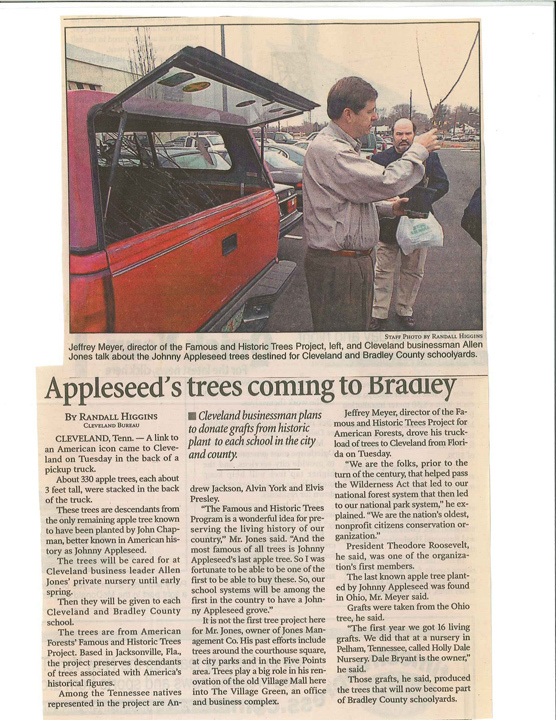 Allan Jones is seen here in one of his many appearances in the popular Bradley News Weekly. 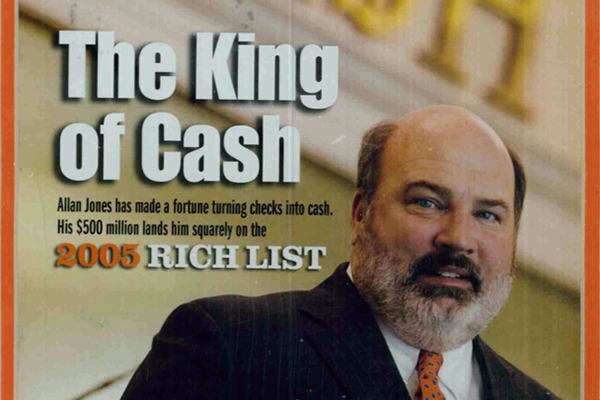 Allan Jones was nicknamed “Kind of Cash” by a Tennessee periodical. Lee University recently began a new surge of campus development that will take its borders to the heart of downtown Cleveland and will result in the creation of "Pangle Hall." The development was made possible thanks to a donation by the Allan Jones Foundation. 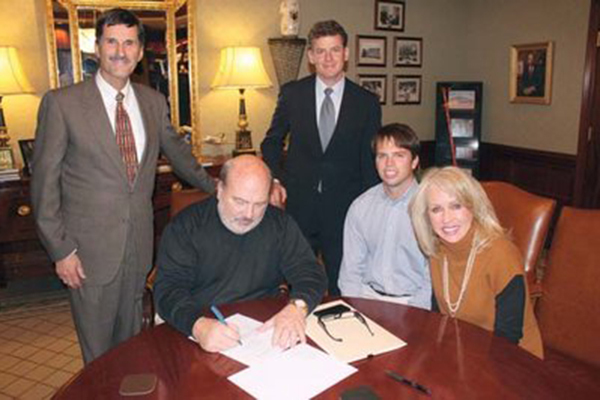 Allan and Janie are seen here with Lee President Paul Conn during the check signing. 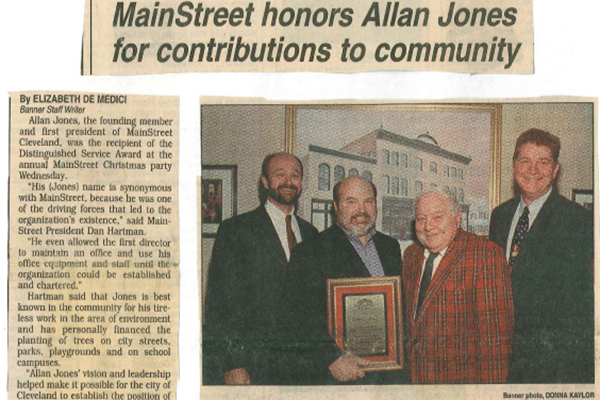 Allan Jones received recognition for his contributions to the community. 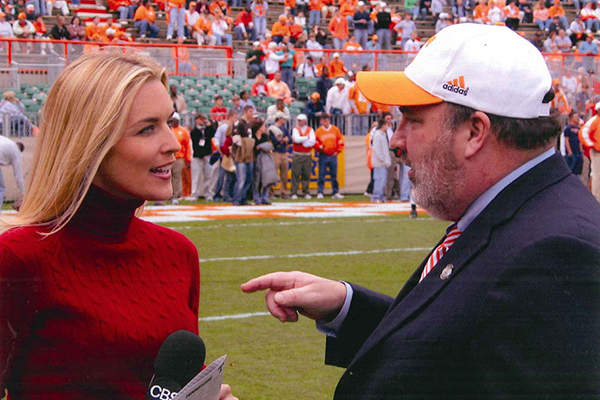 Allan Jones is seen here during an interview with a member of the national news media. 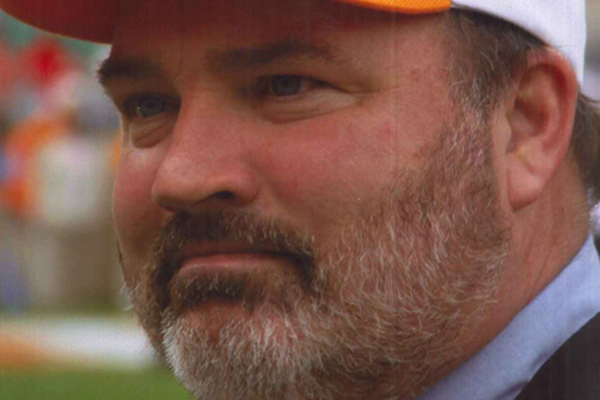 Allan Jones is seen here in a moment of reflection during a Vols football game. 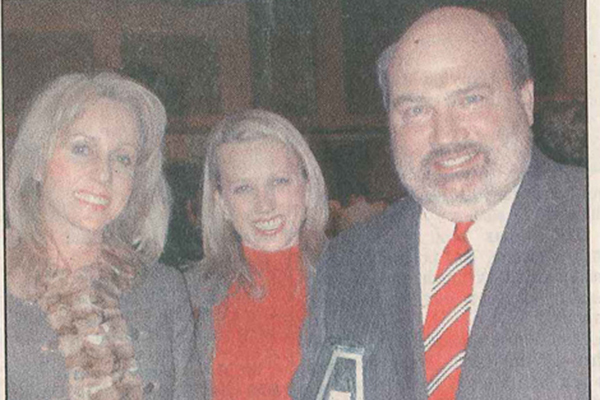 Jim Park – a lifelong friend of Allan’s - offered this toast to the entrepreneur at a charity gala. 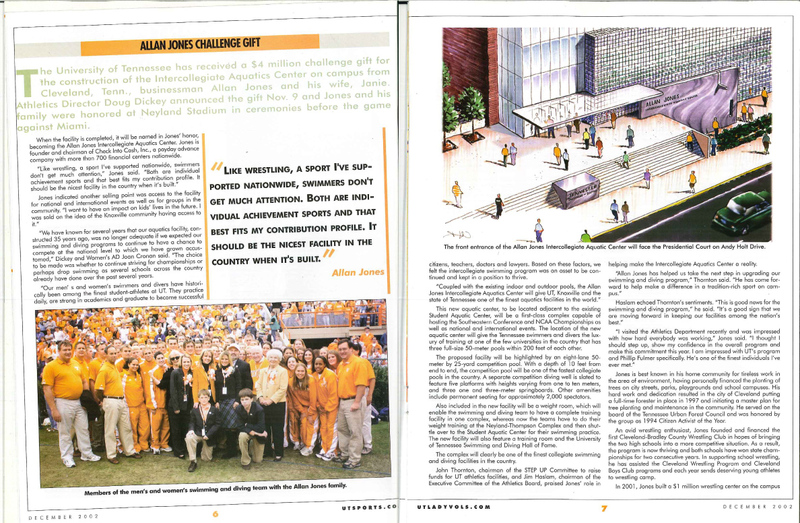 Allan Jones and his family were featured on the cover of the official Tennessee Vols publication. 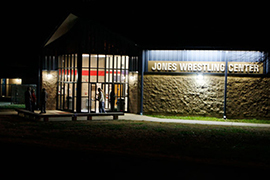 The Jones Wrestling Center opened on the campus of Cleveland High School. 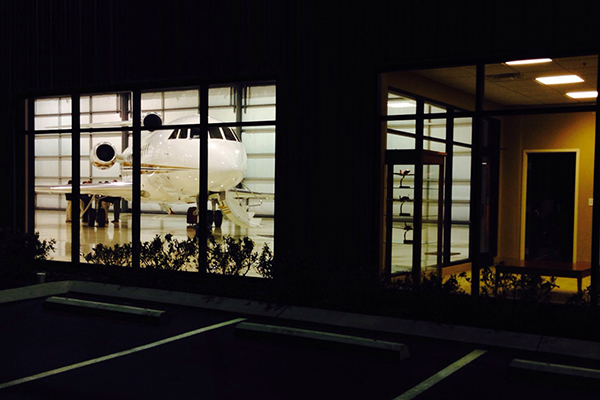 The facility is regarded as one of the best in the nation – every detail is state-of-the-art. Allan Jones and Will Jones are seen here with Olympian Terry Brands. Brands and his brother, Tom, brought their powerhouse Iowa wrestling team to Tennessee in 2012 to face the University of Tennessee at Chattanooga’s Mocs. Vice President Mike Pence traveled to Cleveland, TN, recently to speak at Pangle Hall, named after Mrs. Allan Jones (Janie Pangle Jones). Read about it here. Allan Jones celebrated the 25th anniversary of Check Into Cash with a week of employee appreciation activities. Read about it here. The Washington Post recently celebrated the fanfare over the Aug. 21 solar eclipse by taking note of Allan Jones' donation of 43,000 pairs of NASA-approved glasses to Tennessee students. Read about it here. 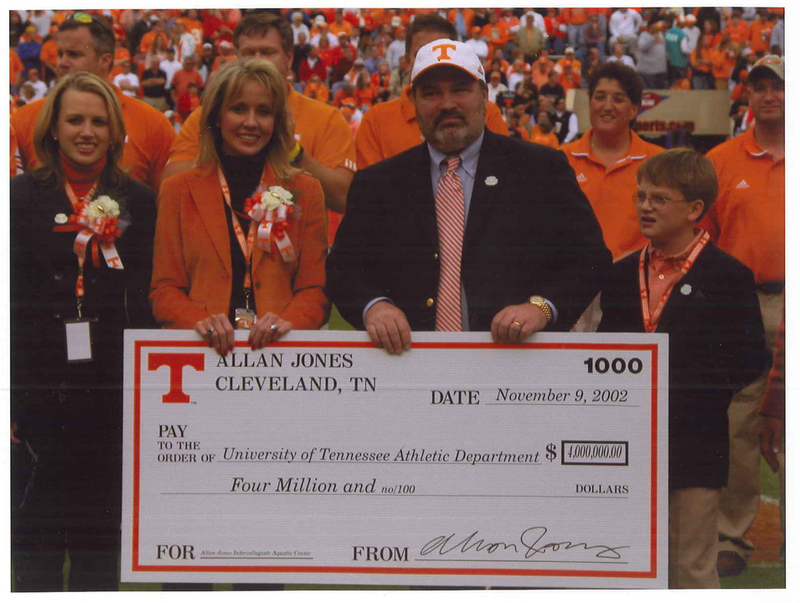 Cleveland’s Allan Jones has been honored by the Tennessee Athletic Directors Association for his philanthropic support to local schools. Read about it here. On the day before Donald Trump’s inauguration, Allan Jones was asked to appear on the highly rated “Fox and Friends” television show. The broadcast was watched my millions across the world. Allan Jones was recently named the first ever "Bobby Taylor" Award Winner. Link to "Mainstreet Cleveland Announces Bobby Taylor Award Recipient"
Tennessee’s Economic Development Commissioner and other officials offered praise recently for successful efforts by Allan Jones to bring a major airplane service company to Chattanooga. 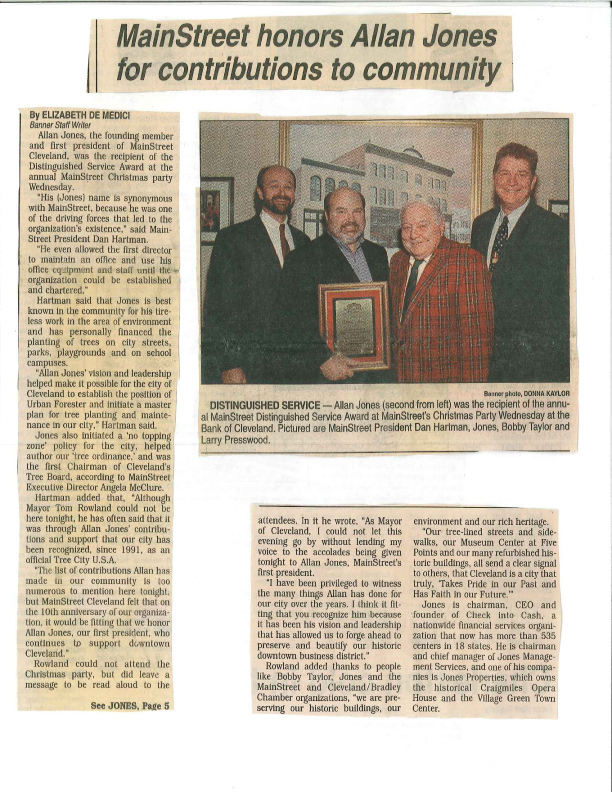 Link to "Allan Jones praised for West Star efforts"
The Chattanooga Times Free Press takes a look at plans by Allan Jones' plan to revive America’s oldest tailored clothing manufacturer. Link to "Jones' Plan to Buy Hardwick Clothes"
Craigmiles Hall has been called the most photographed building in Tennessee. 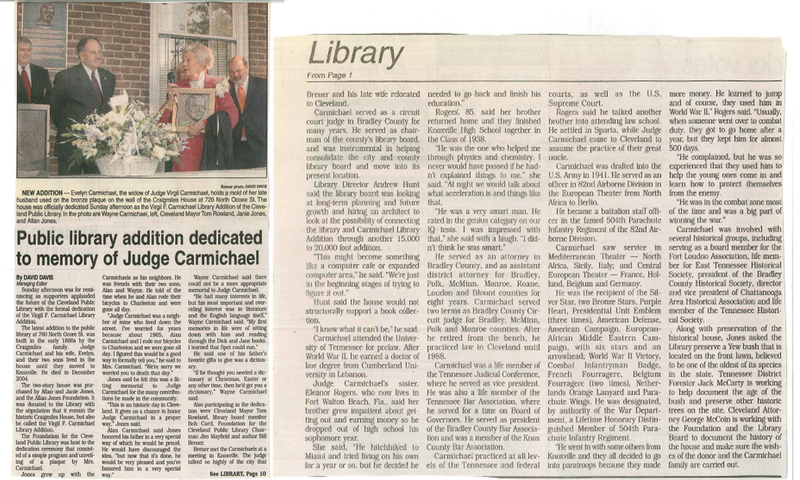 This exclusive gallery features rare photos from the 1996 dedication that took place after Allan Jones bought the landmark and had it completely restored. Link to "Exclusive –Rare Photos of the 1996 Craigmiles Hall Rededication Ceremony"
This exclusive photos shows Allan Jones, a 1972 Cleveland High School graduate, entertaining the crowd at the school’s recent Hall of Fame induction ceremony. Jones was in the first Hall of Fame class. 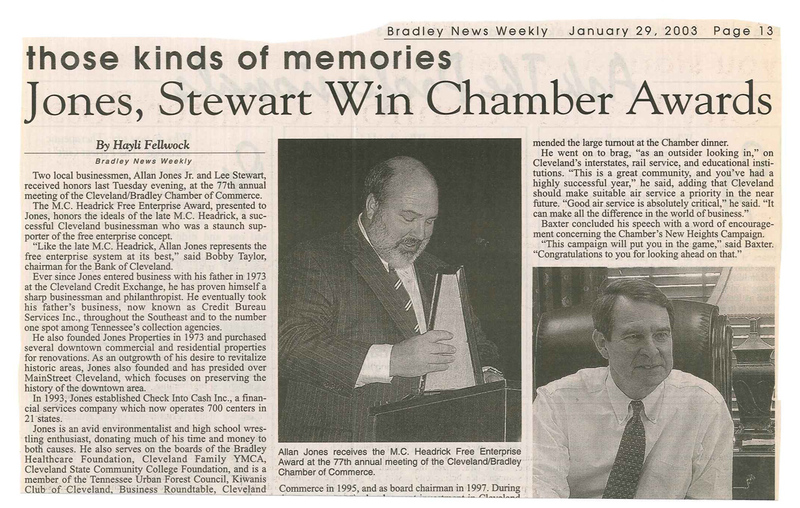 Link to "Exclusive Photo of Allan Jones at Cleveland High Hall of Fame Ceremony"
Check Into Cash recently celebrated its anniversary with a major party. 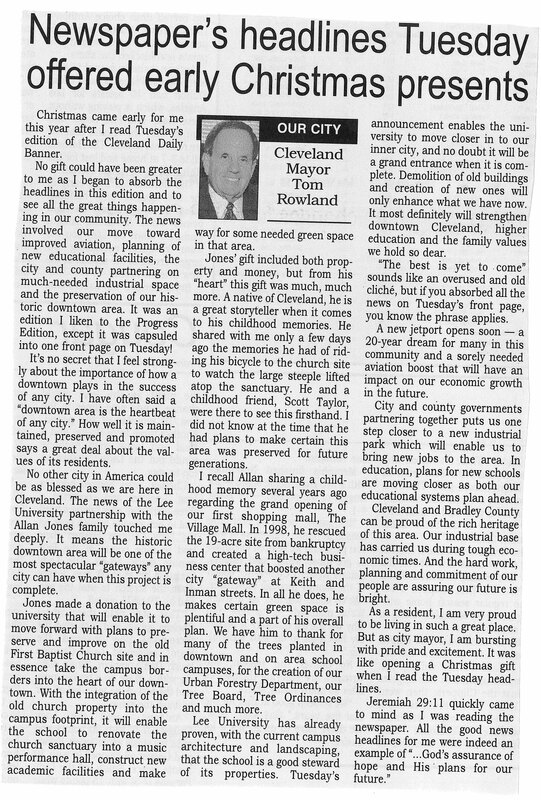 Link to "Company Jones Created Celebrates Milestone"
Cleveland Mayor Tom Rowland offers praise for Allan Jones in the Mayor’s weekly editorial. Tall Betsy’s millions of fans across the United States were finally satisfied when the goblin’s award-winning documentary was released. The Allan Jones scholarship program unveiled last year has placed 175 Bradley County students into classes this fall at Cleveland State Community College. Check Into Cash announces its overseas expansion as demand for the company’s services grows. The millions of people who turned in to watch the Barrett-Jackson classic car auction this year saw Allan Jones engage in a high drama bidding war for charity. A decision by W. Allan Jones to purchase one of history’s most sought after paintings continues to make headlines. The Old Dominion wrestling team recently chose the Jones Wrestling Center as the ideal site for team practice. 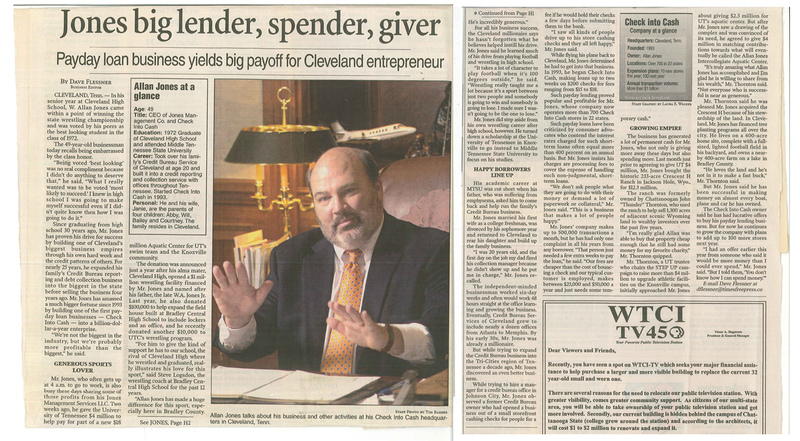 The editor of the Cleveland Daily Banner takes a look at the Tall Betsy phenomenon and shares details about W. Allan Jones’ efforts to revive the legendary goblin. Cleveland State Community College recently honored W. Allan Jones for his efforts to improve education in East Tennessee. Reporter David Davis recounts how W. Allan Jones took time from his busy schedule to work with Cleveland’s Mayor on saving a local landmark. 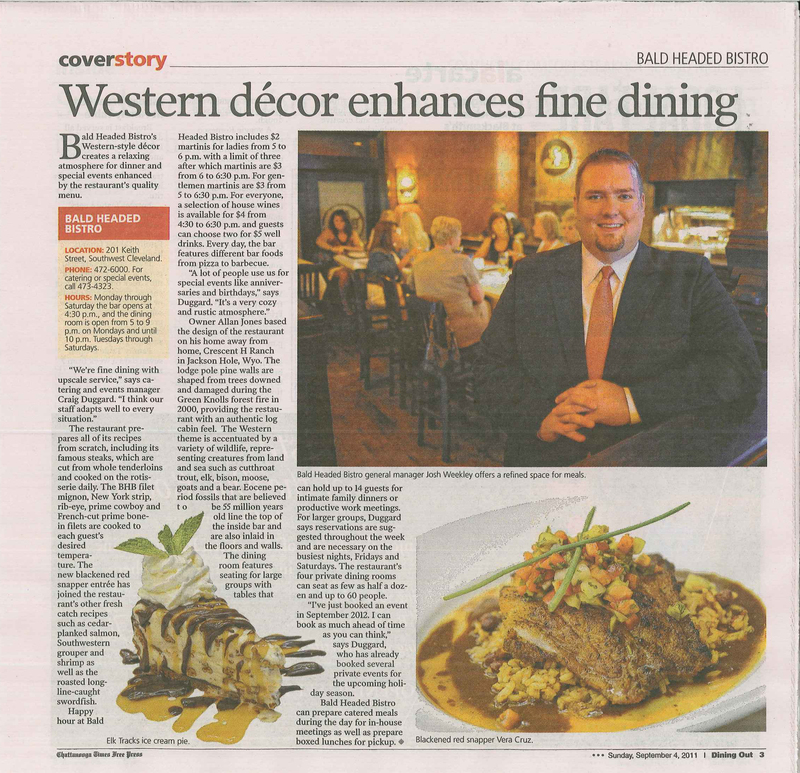 When W. Allan Jones opened the Bald Headed Bistro nearly a decade ago, he had no idea the restaurant would eventually be considered as one of the nation’s best. 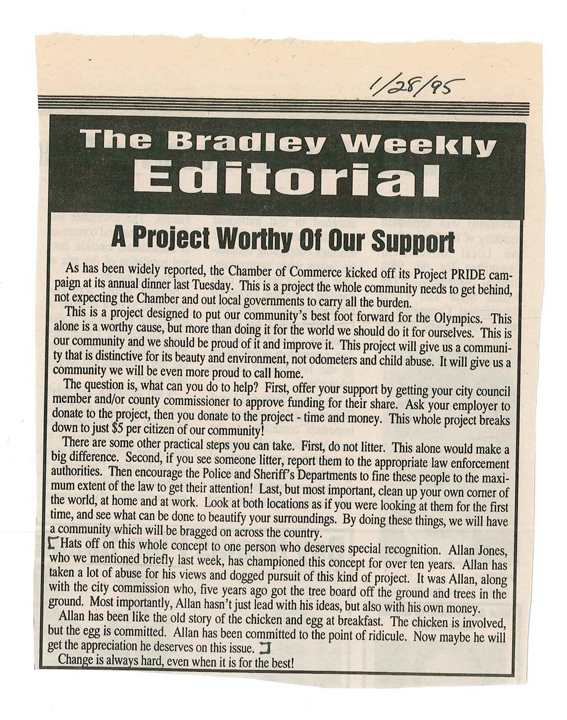 The Bradley News Weekly says W. Allan Jones deserves appreciation for his community efforts. 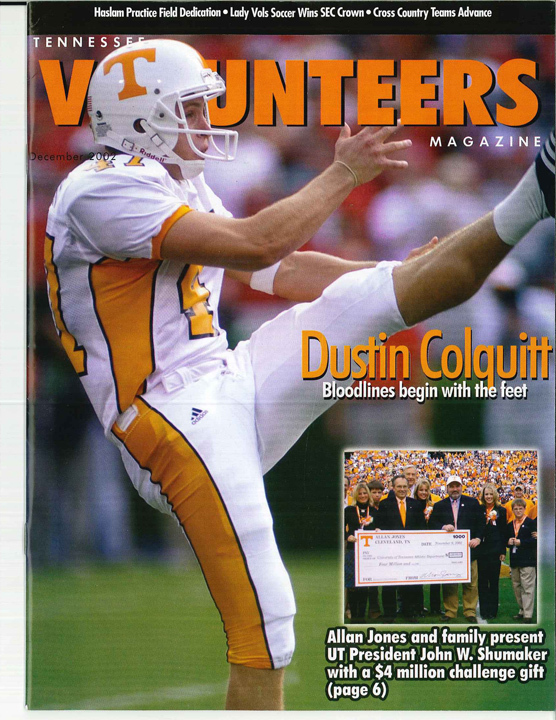 The official Tennessee VOLS magazine featured W. Allan Jones on the cover! 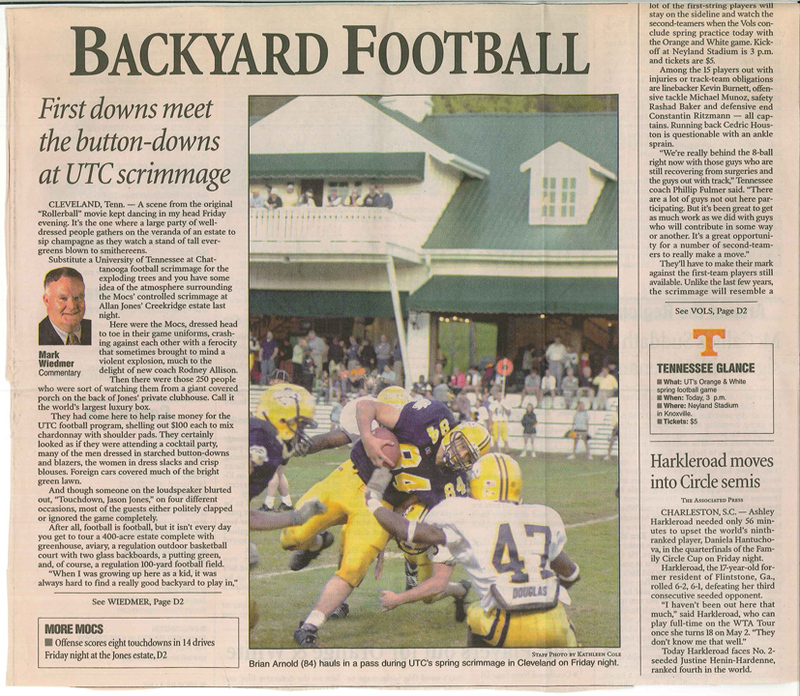 The Chattanooga Mocs got down to business during a game held at the home of W. Allan Jones. 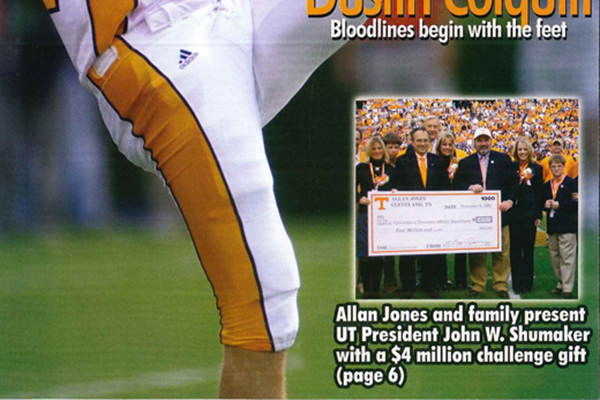 The University of Tennessee received a $4 million challenge gift from W. Allan Jones. 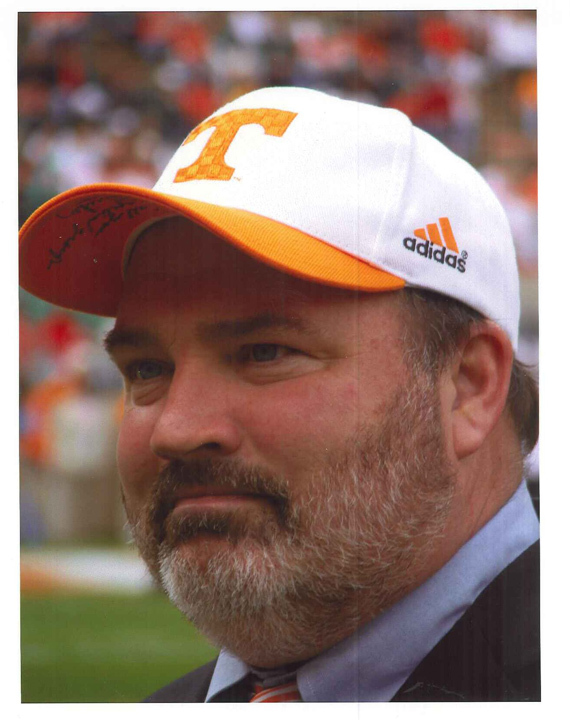 In this candid photo, W. Allan Jones contemplates another winning season by the Tennessee VOLS. 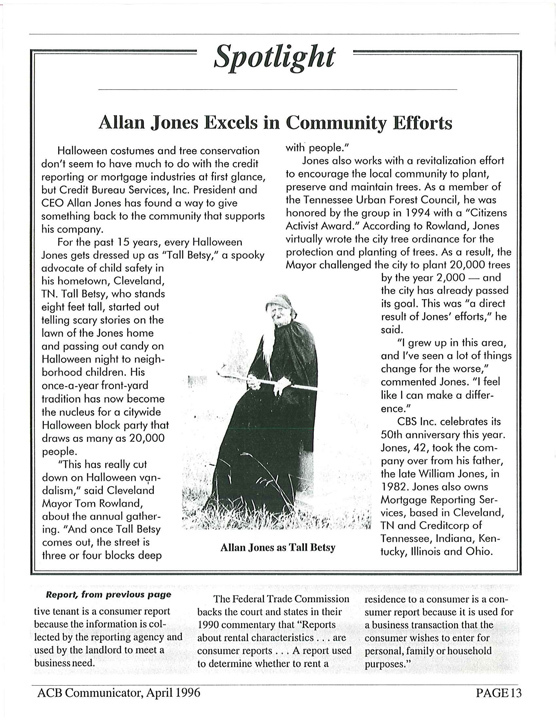 This article focuses on efforts by W. Allan Jones to reduce Halloween vandalism. 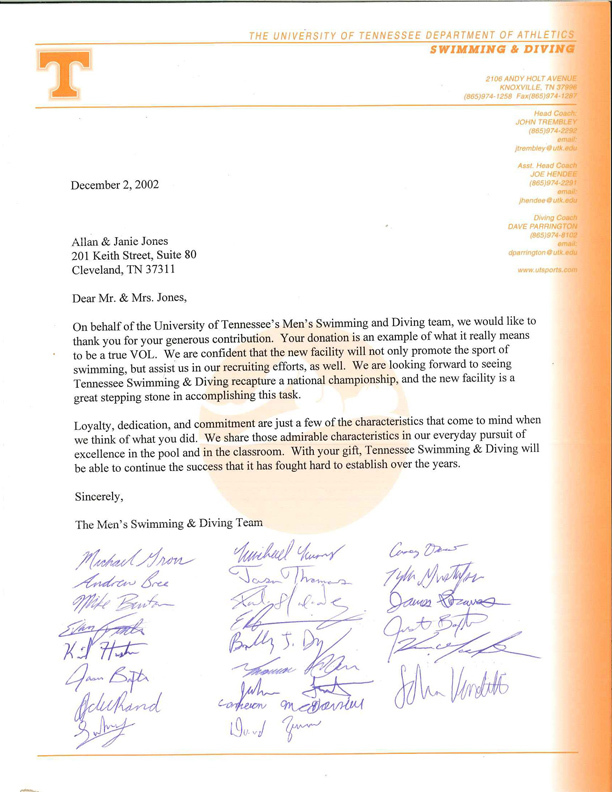 The members of the UTK Men's Swimming & Diving Team wrote a letter of appreciation to W. Allan Jones. W. Allan Jones shows his support for the Men's and Women's swim teams at UTK. 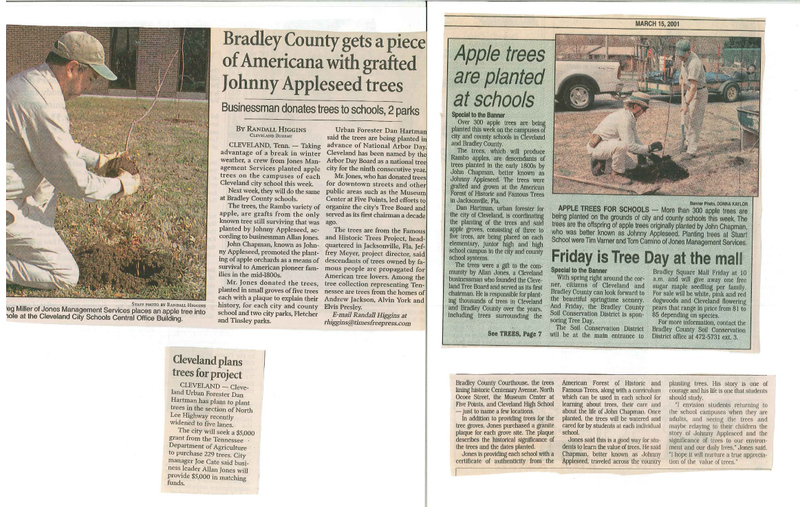 W. Allan Jones donated 300 Johnny Appleseed Rambo Apple trees to local youngsters. 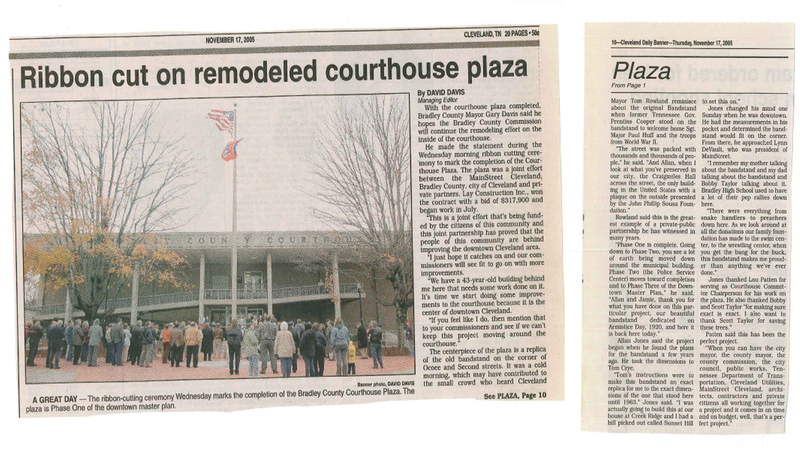 Local citizens gathered to witness the unveiling of the renovated courthouse plaza which included a bandstand made possible by W. Allan Jones. 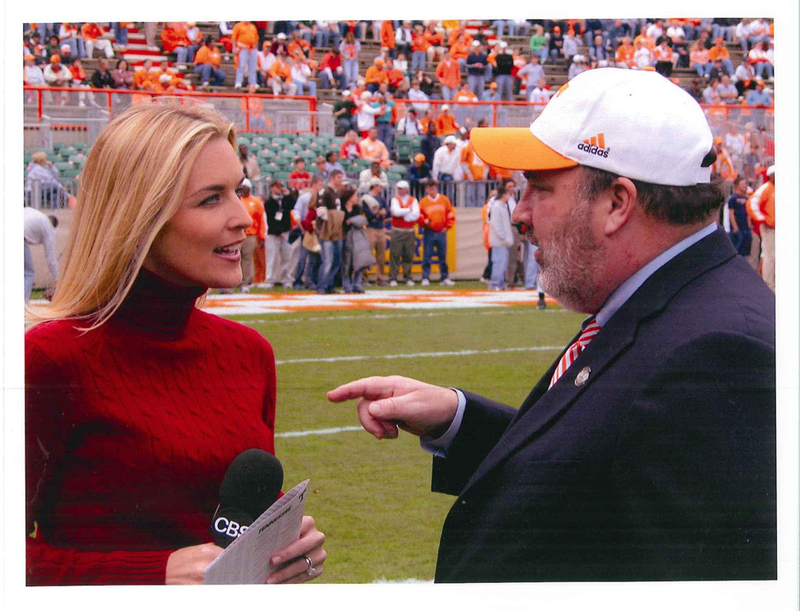 In this rare photo, a CBS reporter chats with W. Allan Jones about his love of college football. 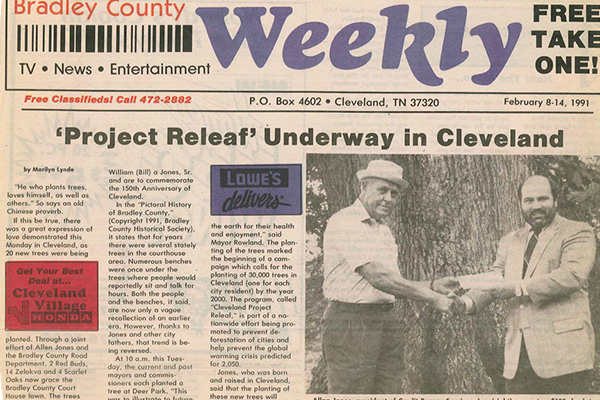 The Foundation started by W. Allan Jones helps beautify the city of Cleveland. 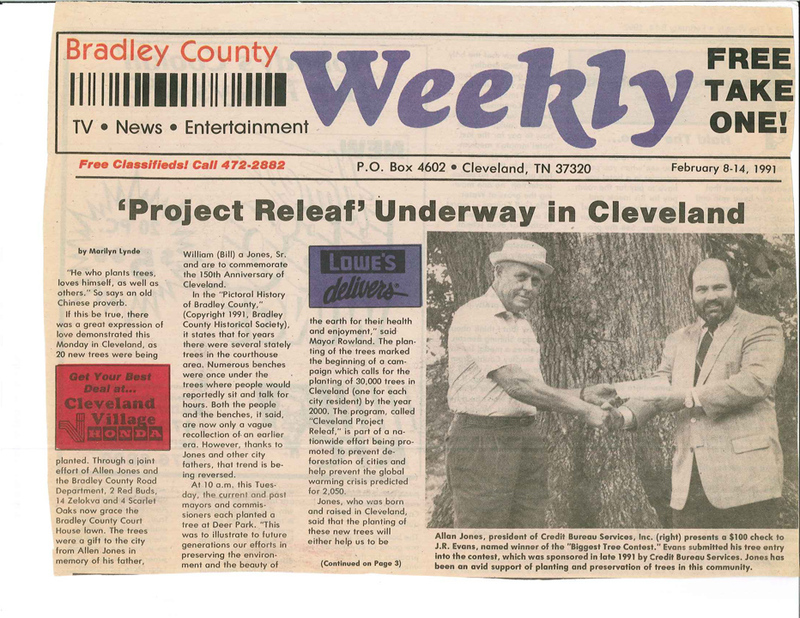 In this Bradley Weekly cover story, W. Allan Jones is praised for his civic responsibility. 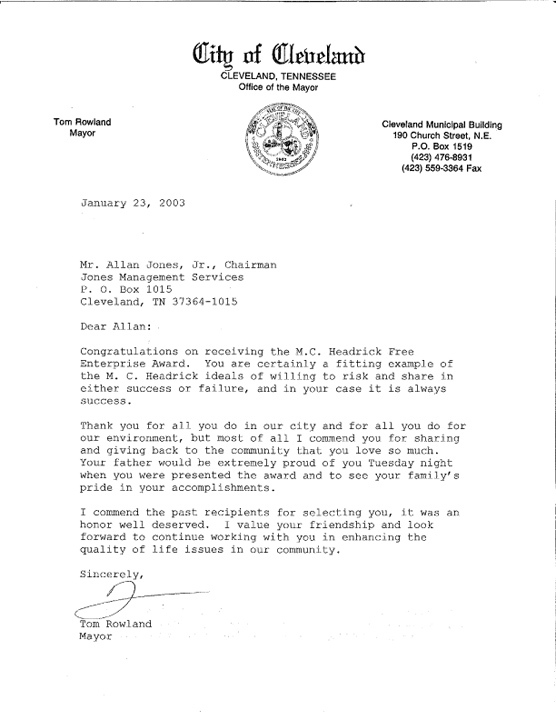 A letter to W. Allan Jones from Cleveland Mayor Tom Rowland. 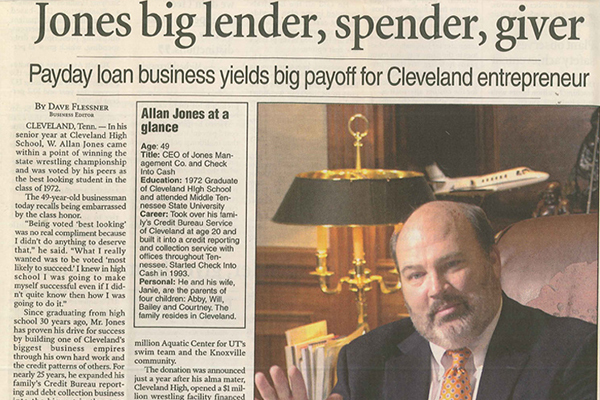 W. Allan Jones was honored for his distinguished service by MainStreet of Cleveland. W. Allan Jones tells Randall Higgins about his efforts to enhance the campus of the Cleveland Public Library. 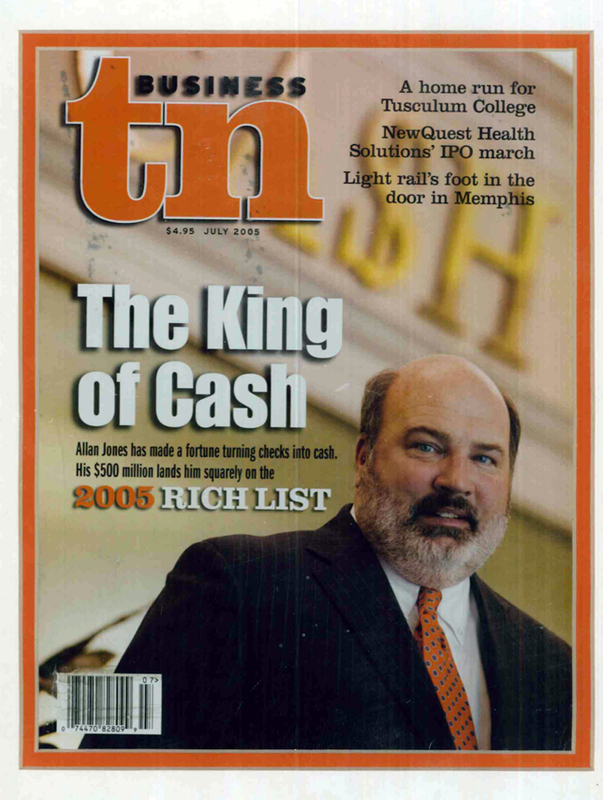 W. Allan Jones Titled "King of Cash"
Business tn Magazine named W. Allan Jones is the "King of Cash" due to his growing fortune and charitable contributions to worthy causes. A photo of W. Allan Jones with his wife and daughter after winning the M.C. 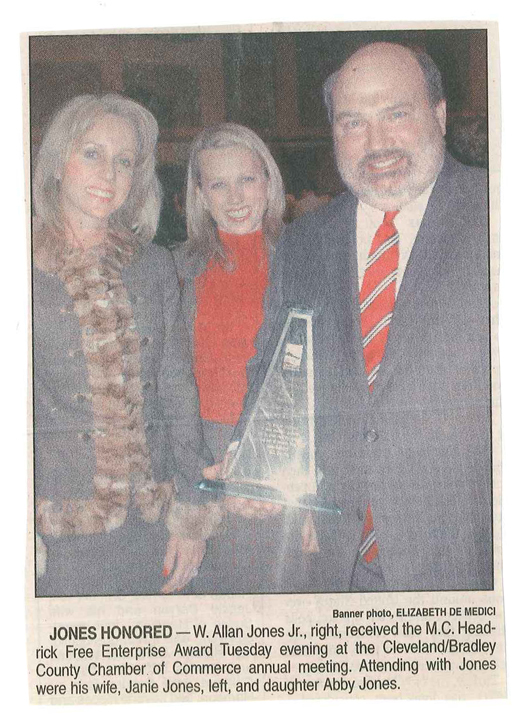 Headrick Free Enterprise Award from the Cleveland/Bradley County Chamber of Commerce. W. Allan Jones gives more than $1 million to the city and county school systems to finance the construction of wrestling facilities. 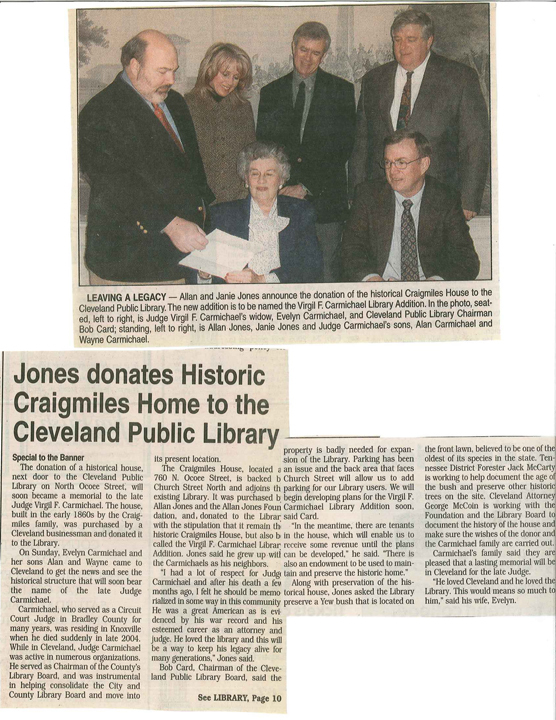 W. Allan Jones donates a historical house next to the Cleveland Public Library on North Ocoee Street. The home was named in honor of Judge Virgil F. Carmichael. 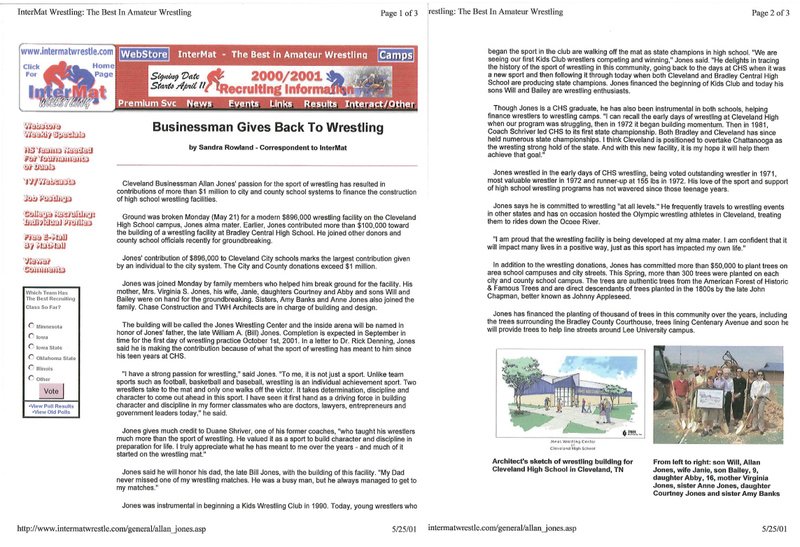 Reporter John Brice provides a look at the opening of the wrestling center made possible by W. Allan Jones. 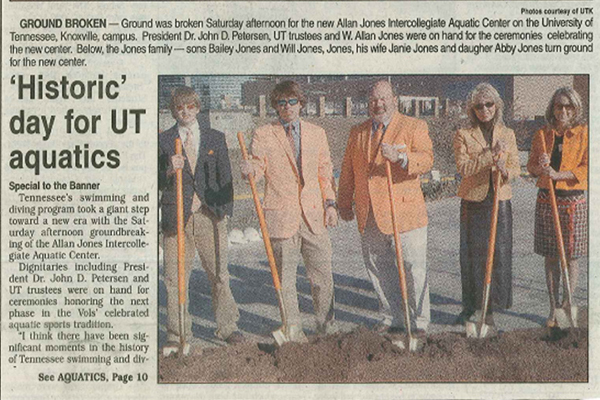 Ground was broken on the new Aquatic Center made possible by W. Allan Jones and family. W. Allan Jones Inducted Into the Hall of Fame. 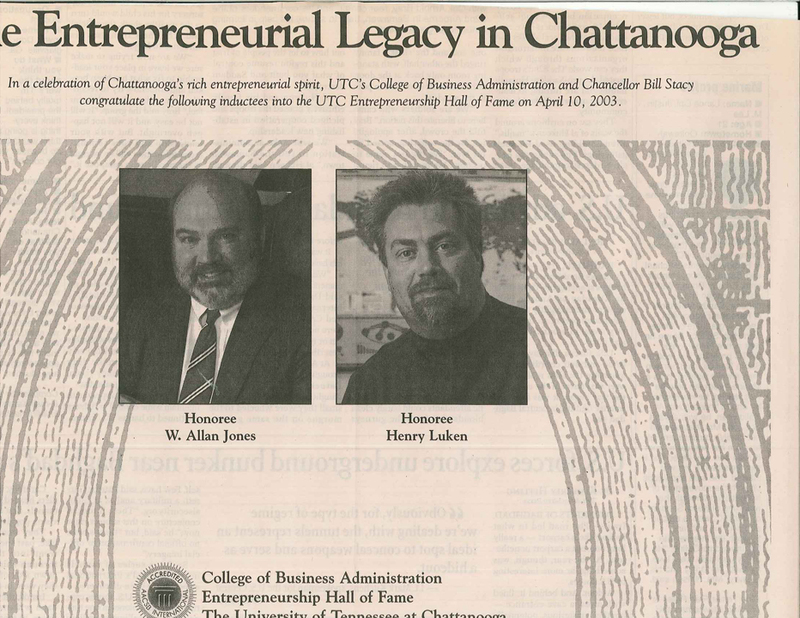 W. Allan Jones is now a member of the UTC Entrepreneurship Hall of Fame. Cleveland officials joined with W. Allan Jones to break ground on a new $896,000 wrestling center. 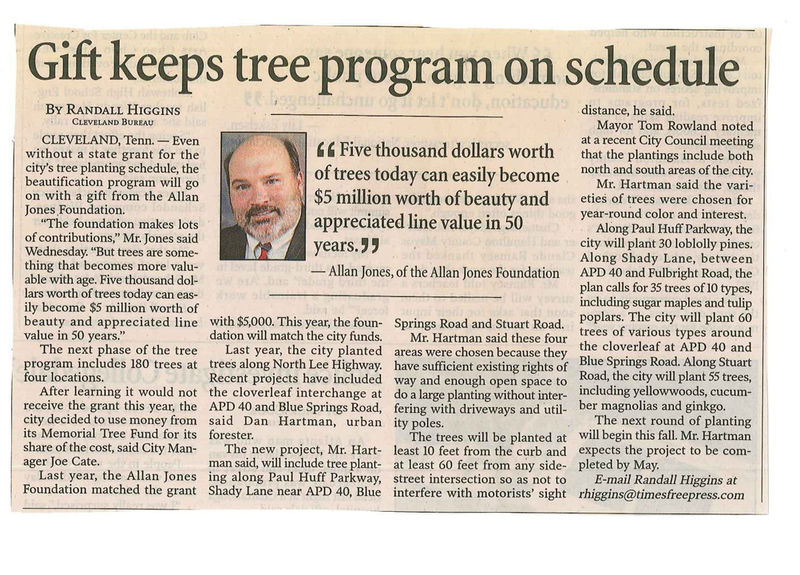 Reporter Randall Higgins takes a look at a recent donation by W. Allan Jones. 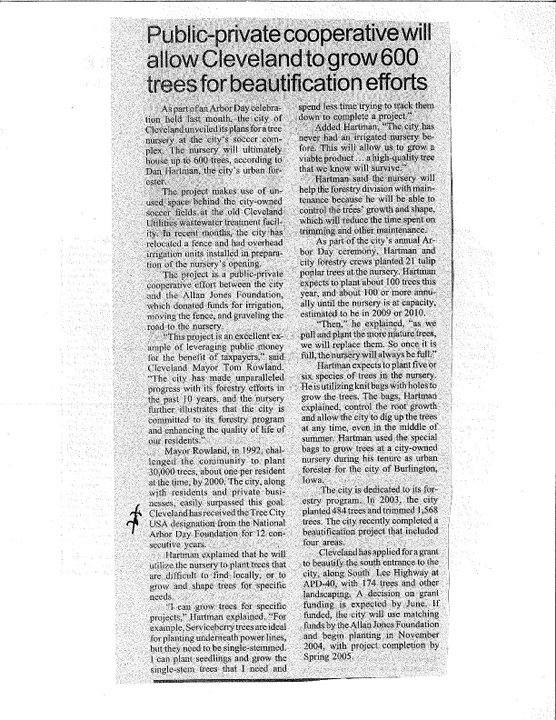 IRandall Higgins reports on a contribution by W. Allan Jones that supports the city of Cleveland's beautification program..
Dave Flessner of the Chattanooga Times Free Press reports on W. Allan Jones and his love of sports and the community. 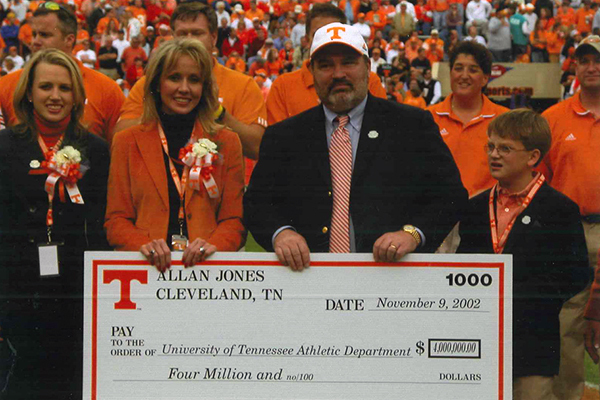 In this exclusive photo, W. Allan Jones and family attend a Tennessee VOLS game to present a $4 million donation to the UTK athletic department. 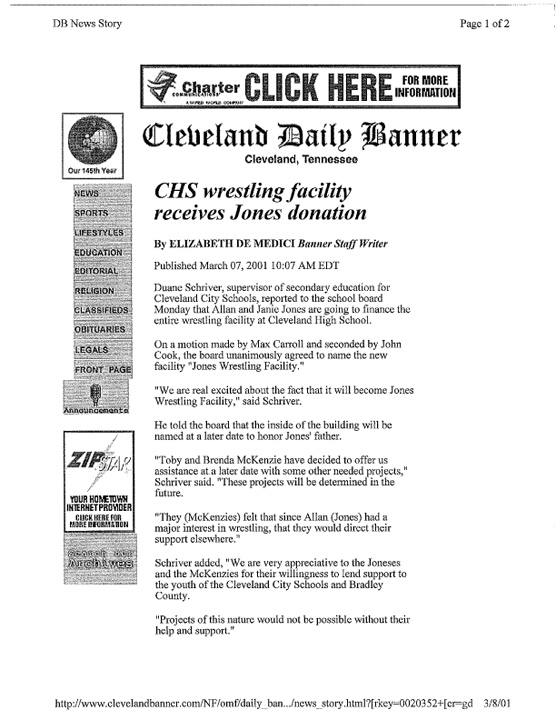 W. Allan Jones announced his intention to finance the entire new wrestling facility at Cleveland High School. Cleveland wrestling coach praises W. Allan Jones for his efforts to make a new wrestling center a reality. 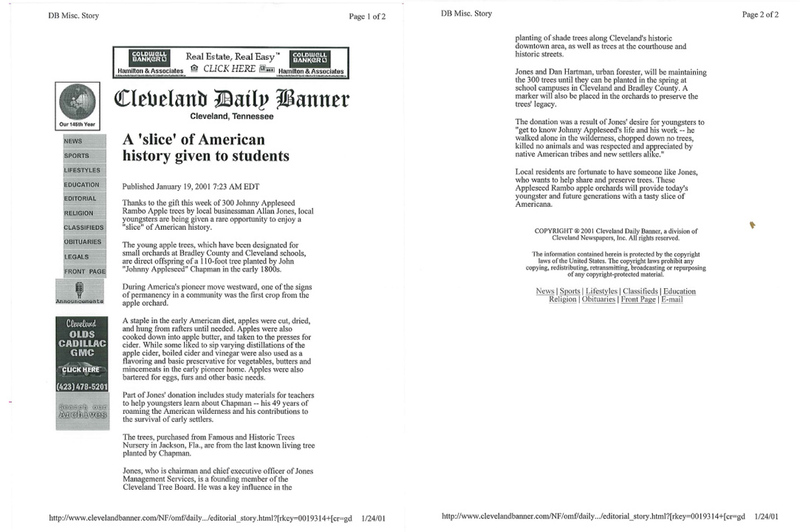 The Bradley Weekly gives W. Allan Jones the paper's highest honor. Charleston School Gets Computers from W. Allan Jones Management Services, Inc. 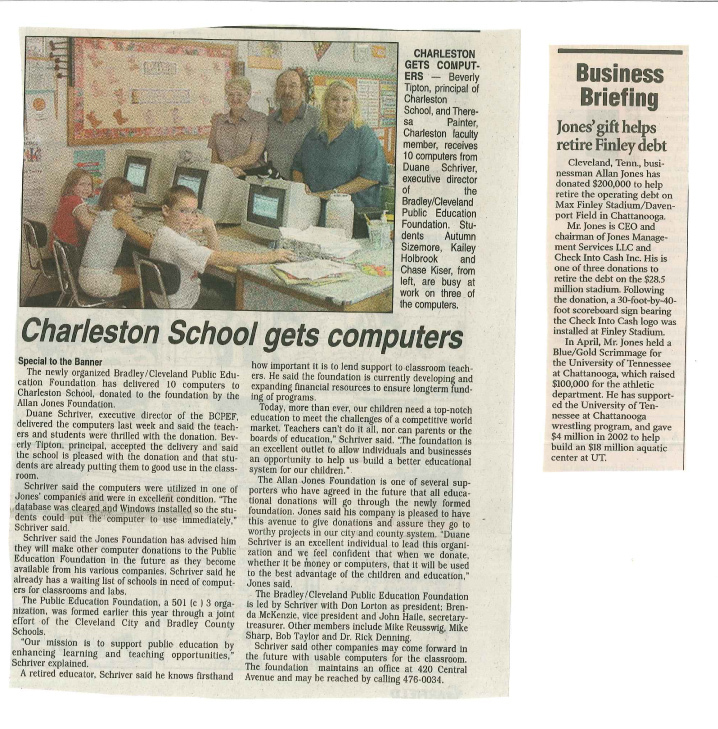 The Bradley/Cleveland Public Education Foundation delivered 10 computers to Charleston School thanks to a donation by W. Allan Jones. 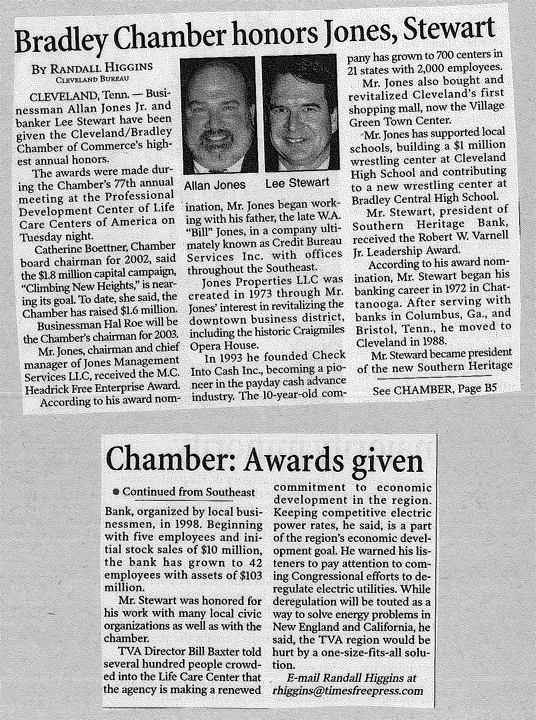 Chamber Shines Spotlight on Lee Stewart and W. Allan Jones Management Services, Inc.
W. Allan Jones and banker Lee Steward received the Cleveland/Bradley Chamber of Commerce's highest annual honors. 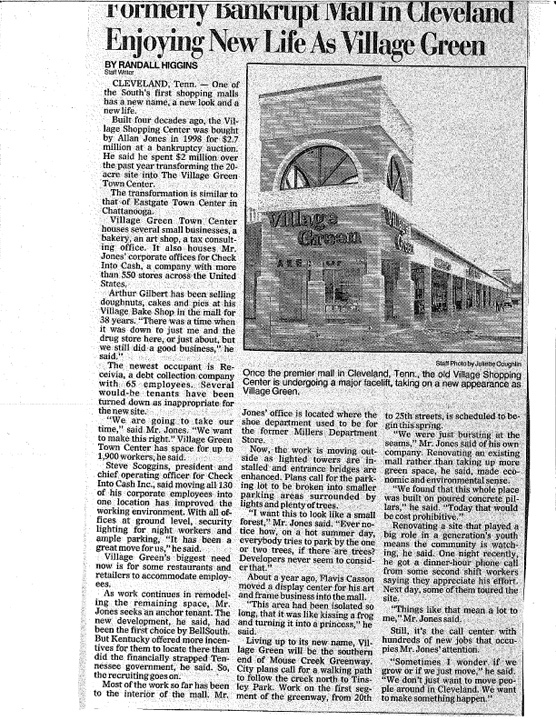 Reporter Randall Higgins contributes this piece that outlines efforts by W. Allan Jones to revive a historic shopping center. 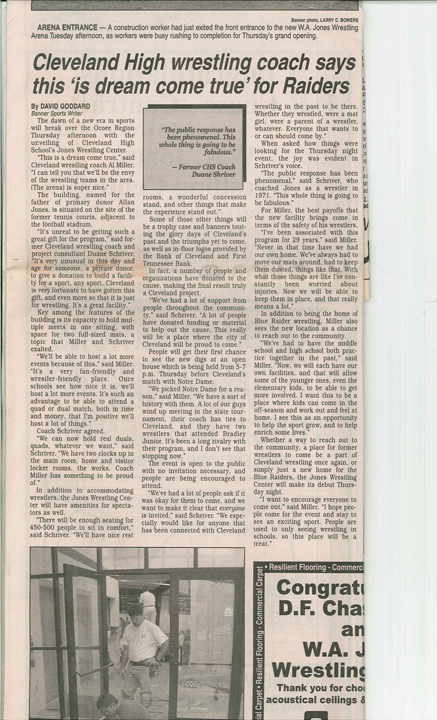 Mark Wiedmer reports on a football game at the home of W. Allan Jones. Reporter Randall Higgins provides details on a plan by W. Allan Jones to deliver an "American Icon" to his hometown. 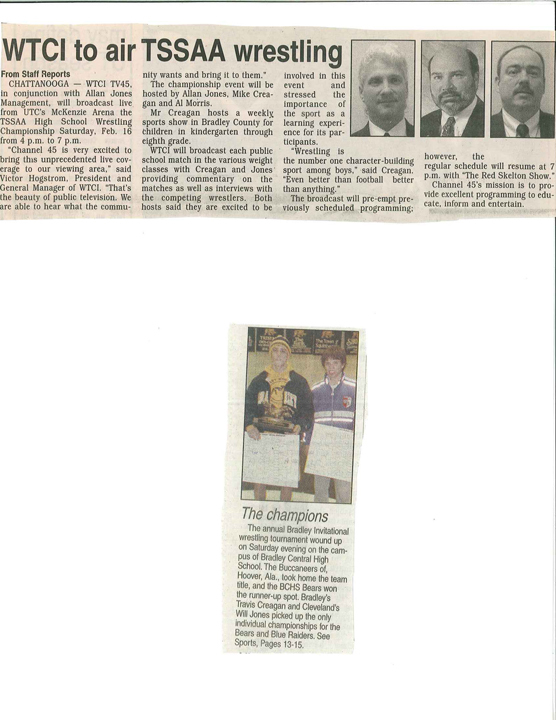 Wrestlers competing in the TSSAA High School Wrestling Championship received television coverage thanks in part to W. Allan Jones. 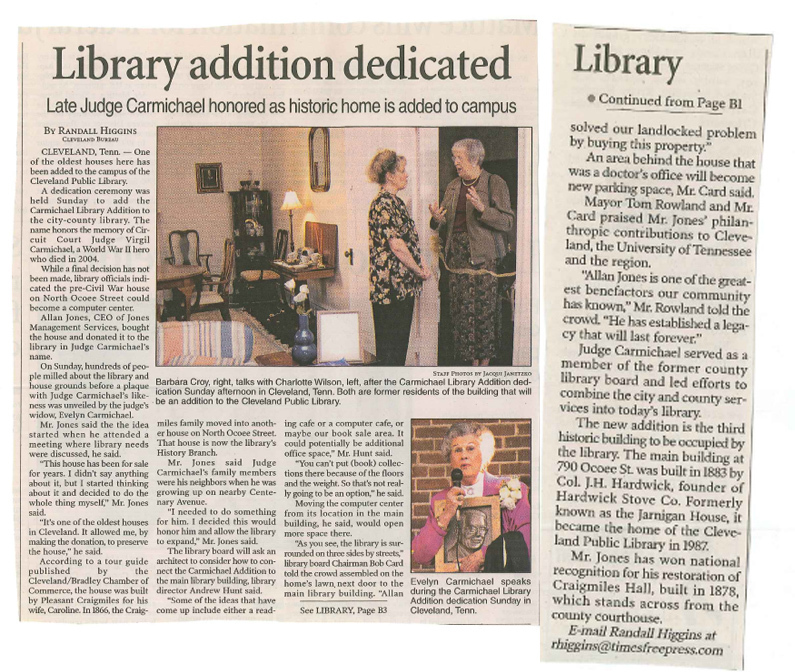 W. Allan Jones dedicated a library to the memory of a legendary judge. 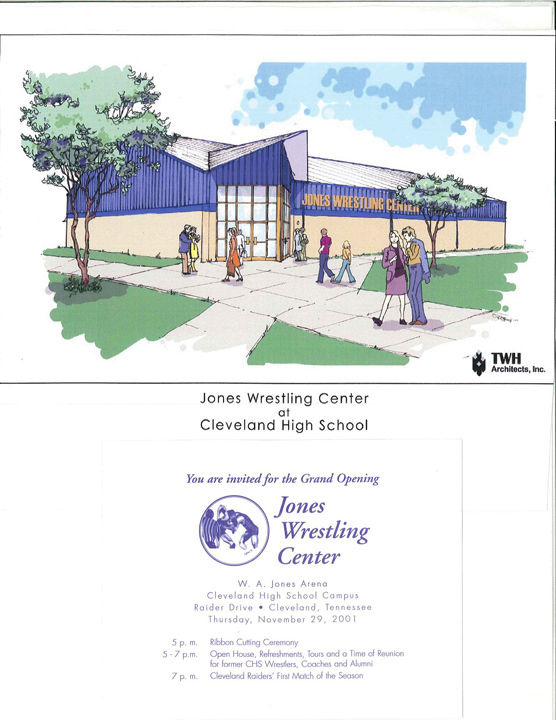 Pictured here is an ad created at the unveiling of the Jones Wrestling Center at Cleveland High School made possible by the generosity of W. Allan Jones. 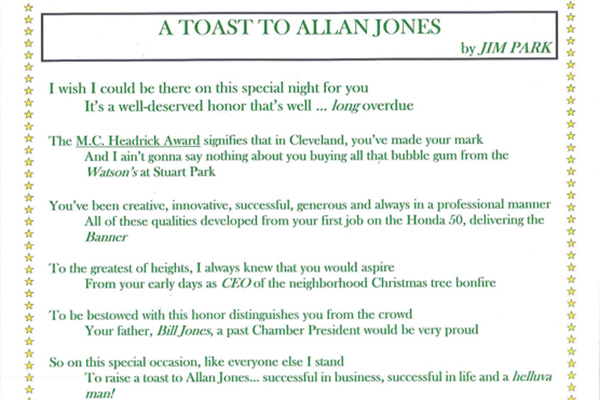 A tribute letter written to W. Allan Jones after Jones won the coveted M.C. Headrick Free Enterprise Award.